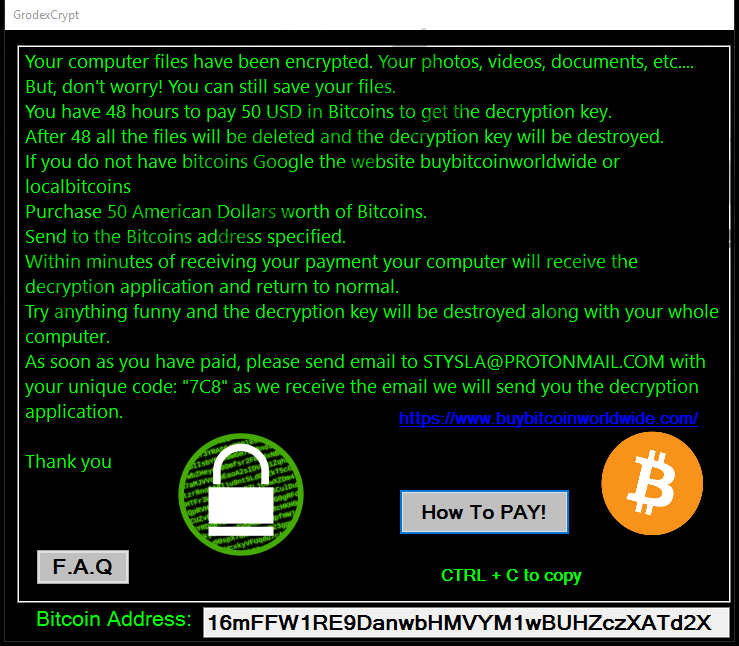 Ransomware infections like GrodexCrypt Ransomware are probably the most prominent malicious threats in the world right now. If several years ago we mostly had to deal with fake antispyware applications, then now ransomware programs are our main security concern. The worst about such infections is that it may be impossible to restore the files affected by the encryption algorithm. Luckily, that is not the case with GrodexCrypt Ransomware, and you can actually decrypt your files without much difficulty. However, even if this program is decryptable, you should still focus on removing it from your computer. And this is why you have opened this page. This description will tell you more about ransomware programs and this particular infection in general. We will also tell you about the most common ways for ransomware to reach target systems. The point is that if you know how such programs spread around, you should be able to avoid installing them on your computer. Yes, you have read right: Users install ransomware on their systems themselves. Of course, they are not aware of that for the most part, and they think that they download something useful. However, you need to learn to recognize the aspects of ransomware distribution and avoid similar intruders in the future. Just like most of the ransomware applications, GrodexCrypt Ransomware tends to spread via spam email messages. Here you would say that your inbox filters spam emails into the Junk folder. Usually, that is the case, but sometimes the spam emails that distribute this infection could be sophisticated enough to get into your main box. Also, some corporate email inboxes might not filter spam that well, and you could find various messages from online stores and even banks in your inbox, urging you to open them and check the attachments ASAP. The moment you open the spam email attachment, you get infected with GrodexCrypt Ransomware and other ransomware programs that might be employing the same distribution method. That is why reputable companies refrain from sending out information in email attachments. They know that it is a security risk, and if you must open an unfamiliar attachment, it is always a good idea to scan it with a licensed security tool first. If you screen an unfamiliar file first, the chances to get infected with ransomware and other types of malware will decrease significantly. So what happens when GrodexCrypt Ransomware enters your computer? This infection first will scan your system, looking for the file formats it can encrypt. It is based on the Crypt888 ransomware, and so you can expect this new infection to behave in a way similar to its predecessor. What’s more, we know that GrodexCrypt Ransomware is also rather similar to Mircop Ransomware and Aviso Ransomware. So there is an entire family of similar infections out there, and it means that if you learn how to avoid one of such programs, you should be able to avoid almost all of them. But, don't worry! You can still save your files. You have 48 hours to pay 50 USD in Bitcoins to get the decryption key. After 48 all the files will be deleted and the decryption key will be destroyed. Even if there was no decryption tool available, you should NEVER spend a single cent on this malicious infection. Please close the ransom note and then get the decryption tool offered by Avast developers. However, please note that you should restore your files only when GrodexCrypt Ransomware is gone from your system for good. Therefore, make sure you delete the infection and then protect your system from similar intruders by employing safe web browsing skills and investing in powerful antispyware applications. Locate the most recently downloaded files. Highlight and remove these files. Run a full system scan with SpyHunter. Quick & tested solution for GrodexCrypt Ransomware removal.